Malaria literally means “bad air”, so named from the ancient belief that this disease was caused by an unknown substance in the air. We now know that it is not just a “bad air” disease but in fact a result of being bitten by a certain type of mosquito. Malaria remains one of the most serious infectious disease problems in the world, killing up to 2.5 million people a year. It is second only to tuberculosis in its impact on world health. Worldwide, a child dies of malaria every 30 seconds. Pregnant women are also particularly vulnerable to the disease. 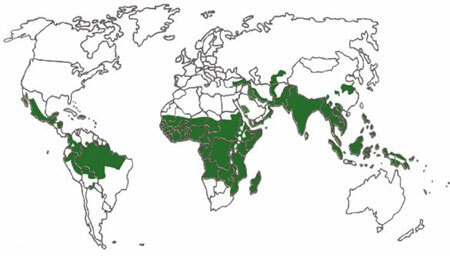 The parasitic disease is transmitted most often in Africa (95%), Central and South America and Asia. The disease is present in 90 countries and infects one in 10 of the world’s population – mainly people living in Africa, India, Brazil, Sri Lanka, Vietnam, Colombia and the Solomon Islands. The number of people dying from malaria is higher now than it was 30 years ago and has spread to new countries. The rise in the number of cases is due to several factors, including increased human population, drug-resistant malaria strains, insecticide-resistant mosquitoes, an increase in the amount and size of breeding grounds (due to construction and changes in the environment), and cutbacks on malaria prevention programs. Although the mosquito breeds in water, that does not mean that you will be safe in arid regions. Mosquitoes will happily breed in anything that can hold water for a week or so, such as discarded cans, bottles, tires, wheel ruts, water cisterns, drains, etc. World map of malaria infected areas. Although malaria can be transmitted through blood transfusions, infected needles and from an infected mother to her unborn baby, in the majority of cases, the disease is transmitted to humans by the bite of the anopheles mosquito. After the mosquito pierces the skin with its straw-like snout, saliva is injected which contains an anti-coagulant to assist the mosquito’s sucking (the mosquito does not inject its victim with blood from a previous meal). At this point, the malaria parasite enters the blood stream. The parasite then enters the blood and passes very rapidly into the liver cells. After an incubation period (usually 1 to 4 weeks) the parasite breaks out of the liver and back into the blood stream. As the parasite hides within the red blood cells, it becomes more difficult for your body’s defenses to slaughter them. The parasite breeds until the cells eventually burst and the released parasites seek other red blood cells to set up home in and breed further. At this stage the infected red blood cells break down and only then does the patient start to develop symptoms. Initially, the victim will develop an itchy reaction to the mosquito bite. This may or may not occur depending on the victim’s tolerance to bites. As the parasite progresses, the symptoms may make the victim feel as though they have the flu. Victims typically suffer from fever, shaking chills, an enlarged spleen, and anemia (low red blood counts), all of which occur in a chronic, relapsing course. If you experience symptoms similar to those mentioned above, it is wise to get checked out for a possible malarial infection (symptoms may not arise until weeks, months or even years in some patients after the initial bite). The only certain way of confirming the diagnosis of malaria is to find the parasite on examination of the patient’s blood. If you feel you may have malaria, it is essential that you undergo a detailed medical examination as soon as possible. Ensure that the medical staff are aware of your history of international travel to an at-risk region of the world. Use insect repellants containing DEET, applied to bare skin. Wear long sleeved shirts and pants, preferably in lighter colors. Try to avoid any gaps between socks and pant cuffs. Sleep using a bed net. Be sure to tuck the bottom of the net under your mattress or bedding so insects do not fly up and under the net. Try not to let your body press against the bug netting. Insects can bite through the cloth if your skin is directly against it. Keep lighted citronella candles nearby. Avoid going outside during active mosquito times (dawn and dusk). Limit use of fragrant colognes and perfumes, which attract insects. Mosquitoes prefer still air so sleep with a fan blowing on you. Smoke from a fire will help to keep mosquitoes away. Sadly to say, all it takes is just one bite from the wrong mosquito to acquire malaria. Although it is only just a small percentage of mosquitoes that may carry the disease, if you receive many bites, your chances of acquiring malaria are obviously increased. Or perhaps you are only bitten once, even though you committed to the above preventative measures religiously, but wound up unlucky and your defenses were breached by a single mosquito. For these reasons, it is wise to be prepared for the bite… just in case. Anti-malarial drugs do not actually prevent you from being infected but, instead, kill the malaria parasites after the liver stage and prevent them from breeding, significantly reducing your risk of becoming very ill or dying. To ensure that you have an effective level of the drug in your system, you will need to begin taking the anti-malarial pills up to four weeks before arriving at your destination (this varies by prescribed drug). The pills should be taken throughout the time that you are exposed to malaria-infected mosquitoes, and then you will need to continue to take the pills for four weeks after you leave the malarial zone to prevent any parasites from breeding that may be dormant in your liver. You may be bitten by a mosquito, have the parasite enter your system and lie dormant in your body for the entire length of your trip. But just because you have arrived home safely and have yet to feel any symptoms of malaria does not mean that you do not have the virus. The one-to-four weeks after being bitten are extremely important in preventing the virus from breeding in your body, instead letting it die a natural death while remaining harmless to you. There are a variety of drugs that are used to protect against the effects of malaria, such as Mefloquine (Lariam), Chloroquine (Aralen) and Proguanil (Malarone). Each drug has its own benefits as well as its own side-affects (such as headaches, mouth ulcers, hair loss or sun sensitivity). The best strategy is to find a drug that offers the best protection with the lowest risk of side-effects. When and where you are going, how long you will be on the drug, your medical history and the side-effects of the drug will all help to determine which drug is best for you. The strains of malaria that are present will also be a consideration, as there are now some types of malaria that have become resistant to certain anti-malarial pills. Resistance to choloroquine, the main anti-malaria drug, is now widespread across Africa and is beginning to develop against pyrimethamine-sulphadoxine, its successor. Regardless of which type you use, you cannot be on these drugs indefinitely. The World Health Organization’s recommendation is to limit your total dosage to the equivalent of about eight years of consumption. For this reason, people living in malarial-infested regions only take anti-malarial drugs if they suspect that they have been infected. Ultimately, your primary defense against malaria should be to avoid being bitten in the first place. Supplementing your bite-prevention defenses with an anti-malarial drug will add to your safety and piece of mind, preparing you for that one unlucky bite. Consult your doctor to find the most effective drug for you.